Athletes and coaches in more than 40 sports use Hudl Technique to improve through slow motion video analysis. Use your iPhone, iTouch or iPad camera to record and break down your technique for instant feedback during a practice, race or game. 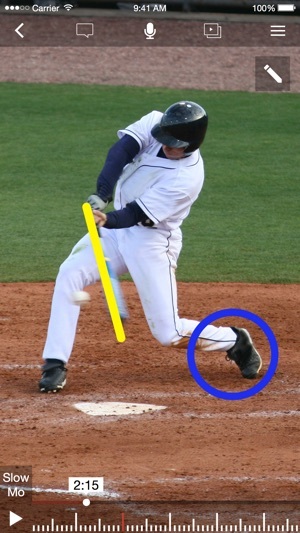 Analyze your baseball swing in super slow motion, compare your tennis serve side-by-side to a pro’s, or study your long jump frame by frame. With Hudl Technique, you can improve at any sport. Download Hudl Technique for free and start improving today. * Record HD video up to 240 FPS (if supported by device). * Import video from camera roll, email or apps such as Dropbox. * Download reference videos from the Hudl Technique community. * Organize and browse your videos by technique and athlete. * Use Favorites for easy access to frequently used videos. * Playback in multiple slow motion speeds and frame-by-frame. * Zoom and pan videos for access to every detail. * Use drawing tools to measure or highlight form. * Compare two videos, stacked or side-by-side. * Synchronize comparison videos for a more effective evaluation. * Create video voice-overs on single or comparison videos. * Add drawings and audio commentary to voice-overs. * Track and compare athlete progress over time. * Use Airplay or HDMI/VGA connectors to mirror to a big-screen for group settings. * Create and manage your team or clients. * Import contacts from your address book or Facebook. * Organize your videos and reviews by team member or client. 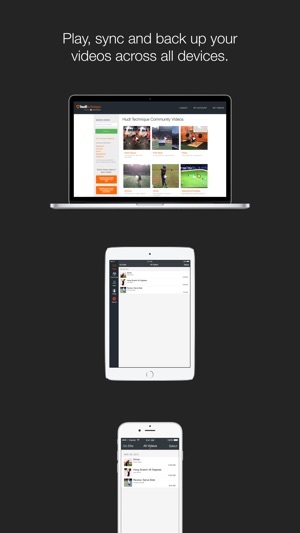 * Coming soon: Roster integration for all Hudl teams. 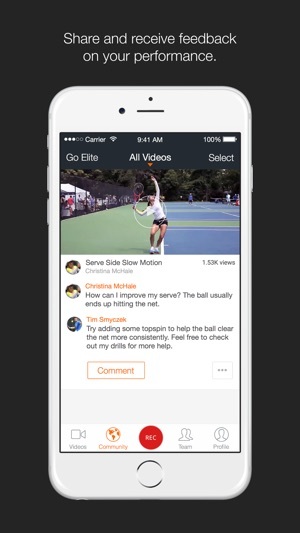 * Share HD videos with athletes, coaches or friends directly from the app. * Post to Facebook, Twitter, YouTube or Dropbox. * Upload shared videos in background while using the app. * Export to camera roll and 3rd party apps. * Watch and download drills from coaches. * Use library of pro athlete videos to compare techniques. * Browse user profiles and engage with them in Hudl Technique or on Twitter. * Create your own profile to be discovered by others in the community. * View videos shared by other members and give encouragement. * Share your own video to get peer feedback. ▶ "This software allows us to post video that our athletes can watch and learn from, regardless of where in the world they are training." ▶ "I bought my iPad solely because I wanted to use [Hudl Technique], and I have it with me for every single training session." ▶ "This is a great app for me. I use it to show my high school hurdlers where they have errors in their technique and we have used it to help several kids improve their technique"
▶ "[Hudl Technique] is an exceptional app! It is an invaluable tool in our performance lab for assessing body mechanics and postural alignment for our athletes." ▶ "Not only is [Hudl Technique] a free app, but it is the most intuitive app I have ever worked with. It has completely changed the way I analyze and communicate with my campers and pupils." Use it all the time!!! I love this app for working with students on their approaches or league bowlers who are struggling, and even more.....on myself!! Showing someone what they're doing is worth more than a thousand words!! They've never watched themselves bowl! I love the "compare" function that allows me to show them their old and new motions (or myself)! They see the changes on screen right there!! I can show it to them either side by side, or blended over the top of each other. (Though blended isn't very clear at times). My only real wish....why should I have to upgrade just to save when I've "compared" and want to keep what I set up? I have to redo the setup with the two videos, align them again, get the timing in sync, every time I have to get out of there. Unless I upgrade I can't save! I use all the functions, but don't want to pay for something I won't be using, that should not be a big thing to keep away from the users like me technology wise! For the people that need more, upgrade! But for someone like me that it has everything I need (except saving compared videos), I should be able to have that ability without upgrading to stuff I don't want. Maybe the techies could fix it?? I am new to Hudl Technique but really like it so far. I would like to be able to add multiple Technique Tags for longer clips, but I have only been able to add a single tag. I also think they should add Parent in addition to Coach and Athlete since we registered and manage clips for a younger athlete. Overall, it is a great tool, taking less storage and is much faster at starting a recording, or deleting one, than the standard iPhone video camera. I use this app and import my bowling swing videos into it. I can find my ball speed and rev rate with a chart that I found online. Also great to view in slow motion my whole approach from set up to release to see the flaws that needs work. Many times what you think you are doing is sure not the case when viewed back in slow motion. I rate this app as 5 STARS! © Agile Sports Technologies, Inc.